There are several different types of dentures or dental plates. The simplest way of looking at them is by the material they are made of and by how many missing teeth they replace. The cost involved varies a lot between the different types of dentures, with the smaller and simpler types being cheaper and quicker to make. The more complicated the design, the longer it will take to construct, and the more expensive it will be. The simplest types of dentures are made of acrylic, and replace just 1 or 2 teeth. These dental plates are relatively quick and cheap to make, and it's easy to adjust or modify if it needs more acrylic or another tooth adding to it. 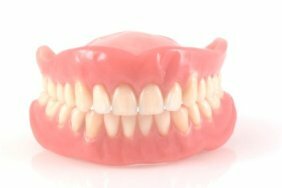 You can read more about these different types of dentures at my Dental Flipper page. At the other extreme, there are full dentures (sometimes called "complete" dentures) which replace ALL the teeth in an upper jaw or lower jaw. In addition to replacing all the teeth, they also replace any gum tissue and jaw bone that has shrunk down as a result of not having any teeth. Different Types of Dentures - Acrylic or Metal Alloy? Full (or "complete") dentures are always made of acrylic, in a pink gum color. Sometimes, however, they may have a metal palate, that fits into the roof of your mouth, for extra strength. This is made of a lightweight alloy called chrome cobalt (or cobalt-chrome, just to be confusing!). This is extremely strong, and helps to prevent cracks developing in the denture. A chrome cobalt palate is normally used where a person tends to have problems with an upper denture breaking regularly. In most cases, this can happen where the person still has all their own natural lower teeth, but has lost all the upper teeth. In this situation, you can still bite with quite a strong force with the lower teeth; sometimes enough to create cracks in the acrylic of the upper denture, which eventually breaks. The chrome cobalt palate is strong enough to resist this. BUT there is a trade off (as always. . . .); the metal palate doesn't fit quite as snugly as a 100% acrylic dental plate. This means it doesn't stay in place quite as well as a full acrylic denture. This doesn't matter if the shape of your palate and gums is good for holding a denture in place. BUT if you're having problems with getting a denture to stay in place, AND you're having problems with dentures breaking, then you'll need a different solution. One alternative is for the dental technician to use a high-impact acrylic, which is much stronger than normal acrylic. But also more expensive. In the middle between the one-tooth dental flipper and the full denture there are partial dentures that use the extremely strong cobalt-chrome metal alloy as a skeleton or framework to replace from 2 to around 8 teeth. There must still be some healthy, solid teeth in the mouth for the denture to clip to. The cobalt-chrome framework or skeleton can be made very thin and very light, and so is much less obtrusive in the mouth. For the same strength, an acrylic based denture would have to be 4 to 6 times as thick, and substantially heavier. You can get an idea of how these types of dentures look at my Pictures of Dentures page. You still have a few teeth left, maybe 3 to 5, which are not in great condition, but still worth saving. We can use these teeth as supports for what is called a "telescope" denture". This involves trimming down the remaining 3 to 5 teeth for small gold crowns. 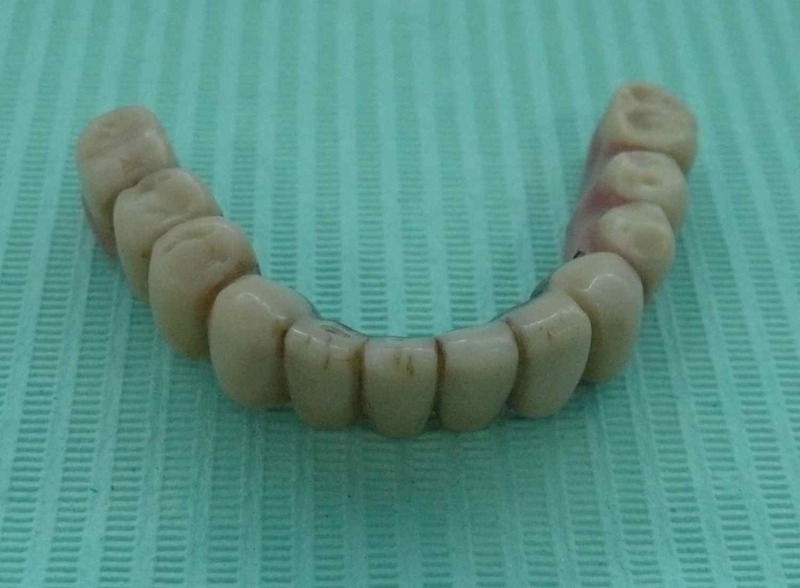 The denture is made so that it looks like a normal full denture from the outside, but inside there are gold alloy "sleeves" that fit over the crowns in the mouth very precisely. This makes the denture very stable. It can also be smaller and neater than a normal full denture, because it doesn't need all the acrylic over the gum areas to help keep it in place. The telescope crowns hold it in place firmly. OR, you have absolutely NO teeth left, your gum has shrunk right down, and it's impossible to get a denture to stay in place properly. In this situation, we can think about using some dental implants to act as anchors for the denture. 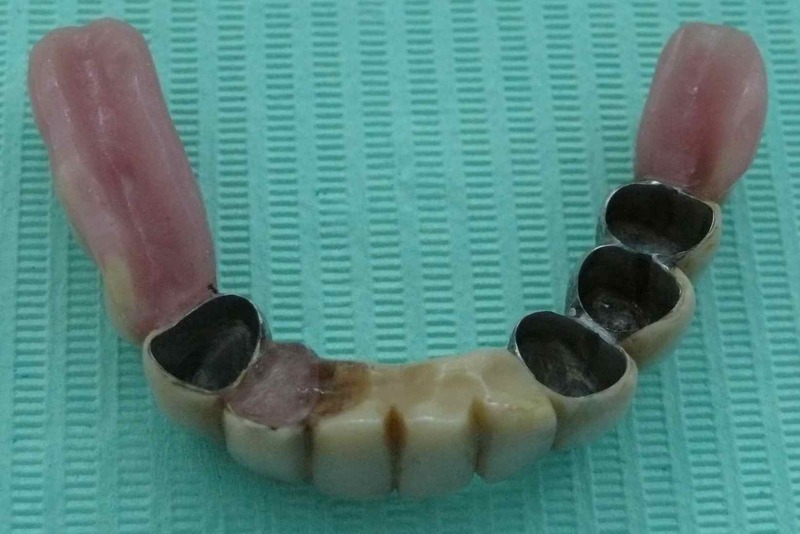 This is called an "implant supported" or "implant-borne" denture. First option, get 5 or 6 dental mini implants fitted, supporting a denture that you can take out to clean. ie. it's removable. Second option, get 2 to 4 normal-sized dental implants, supporting a denture that is also removable - you can take it out at home for cleaning. Third option, get 4 to 6 normal-sized implants carrying a "fixed" denture, (sometimes called a "beam bridge). You can't take this out at home. You have to go along to your dentist every 12 months or so to have it unscrewed from the implants and professionally cleaned and re-fitted. These different types of dentures and dental plates vary a lot in cost. The bigger and more complicated the denture, the higher the cost. In particular, dental implants will drive up the cost. BUT costs also vary a lot between areas, towns and cities, and also between dentists. So it's always worth phoning around a few different dental offices to get an idea of their charges. You will need to visit a dental office first, to find out what types of dentures might be suitable for you. After you have that information, you can start to make the phone calls! For information all about how to look after dentures, go to Best Denture Products.